The best way to warm up yourself during the cold winter evenings in Scandinavia is definitely Glögi. This traditional Finnish drink (usually alcoholic) is an integral part of Christmas routine. Even if you are not pro in cooking you can easily make it from everyday home ingredients according your own preferences, because the best part of the recipe – no strict instructions. If you enjoy astringent taste of spices, cinnamon and nutmeg, like I do, – this delicious mulled wine should be your choice! In a mid-size sauce pan heat water/concentrate drink mix and sugar over medium heat until sugar is dissolved for about 1.5 minute. Add spices. Preferably do not use ground spices, otherwise mulled wine will turn out muddy. Pour wine and add chopped fruit. Remove the drink from the heat before boiling. To serve, drop a few nuts, berries or raisins into each glass and serve hot. 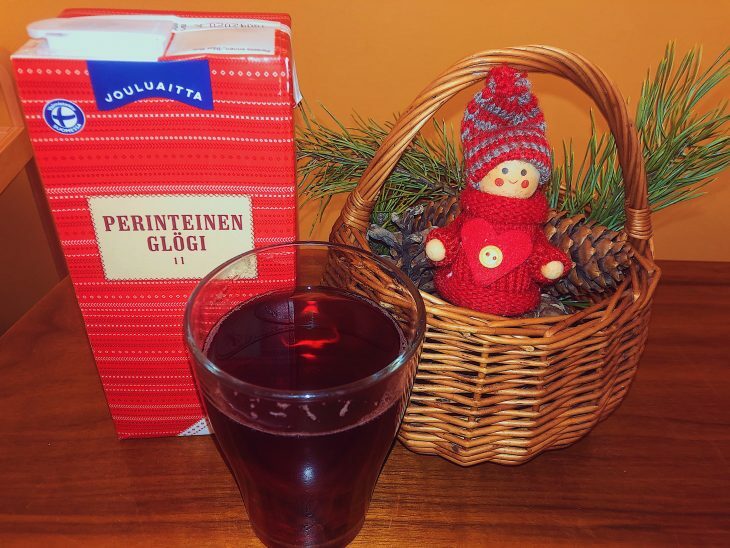 Glögi can be made 24 or 48 hours before serving, just cover and put it in the fridge. A mug of warm aromatic mulled wine will undoubtedly be a wonderful addition on a cold winter evening with friends. Try not to get burned! Hyvää ruokahalua!